Burn calories while you sing karaoke to get the best ab workout not found in your gym but instead at home or even at the bar with abdominal breathing exercise. Karaoke gives you a chance to burn calories by turning simple abdominal breathing exercises into a weapon to help you lose weight while relieving stress build up during the day. It's a win-win situation that you would be bored out of luck to refuse. Infused into the setting brought up by Japanesekaraoke parlors is an ever flowing break from reality that people in Japan love to act out after a long hauled day of work. Even if that is the case, you would be DAMmed not to find a karaoke machine that doesn't display the amount of calories you burn off per song. 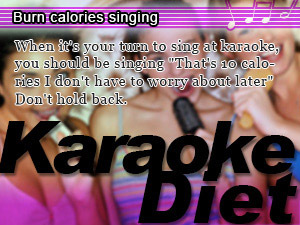 How many calories do I need to lose weight singing karaoke? You may be in it blow off stress and simply enjoy yourself, but for the business side of you that cares about what you gain out of the exchange what is important in knowing is that singing(I mean really singing) burns of calories. Burn calories off you can take to the bank and exchange for good hard earned pounds of weight loss. Karaoke is not the only option you have to get up and sing in front of the mic at the bar. Playing rhythm games such as rock band or any other game that pushes you at a vocal level does the trick. 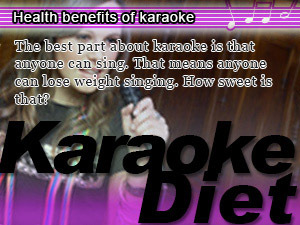 So if you are looking for a way to burn more calories boosting your metabolism you should pick up the karaoke diet. You never know you may like it more than singing in the shower. In this episode of Slism, we will introduce thee karaoke diet as it is trending in Japan and discuss how you can take abdominal breathing to the next level turning a good night of fun into a zero calorie effort. Just writing lose weight only by singing sounds like a big scam not a good way to burn calories. I know it sounds funny but consider how tired you are only after a few songs. Let's take a look at where the road from dieting and exercise meets with technology and karaoke turning innocent fun and games into a great way to lose weight. Where the karaoke diet gets most of its pull on helping your lose weight is when you really start singing and actually feel a stretch in you focal cords as stress lifts off your chess like smoke being carried away by a violent wind. For this reason you are going want to take breaks between songs. Abdominal Breathing While You Sing Does What!? When you sing out loud naturally you feel a reflex to breathe in deeply exercise what is called abdominal breathing a highly effective breathing exercise that does wonders for your diet helping you burn calories without thinking and get a flatter stomach toning your abs. As you know there are two kinds of breathing: respiratory breathing; and abdominal breathing. The latter serves as an aerobic exercise helping promoting the burning of belly fat tightening hard reach places around the waist. Turn the enjoying karaoke into a tool for your diet helping you trim down your body relieving stress. No more feeling irritated from having an empty stomach or obligation to go out and get some exercise. There are all kinds of diets just waiting for you to pick up and try and the karaoke diet is one of them, a fun and enjoyable alternative to conventional exercise. The breathing technique you are used to using is respiratory breathing expanding your rib cage as your breathe. When you breathe in your chest expands as it is being filled with air. If as you breathe your shoulders level rises, then you are doing respiratory breathing. As you wake up in the morning raising your arms in the air sucking up a big gulp of crisp morning are you are breathing through your chest unconsciously. Although you may not notice as breathing can be done without thinking, most of the breathing you do is made up of respiratory breathing. On the other hand while singing and as you pass verse by verse taking little spurts of breaths in between, this is abdominal breathing that works your diaphragm as you breathe. When you breathe in your stomach expands and when you breathe out your stomach gets drawn in. Respiratory breathing is where you use your chest and abdominal breathing is where you use your diaphragm to breathe. Just by employing different parts of your body do the effects your diet and exercise plans differ entirely. By breathing from your abdomen you work you diaphragm. This is said to be effective in promoting good circulation throughout your internal organs activating the core of your body to burn off more energy. In addition, by waking up your internal organs you increase nutrient absorption of your body making it easier to keep fat from piling up. Breathing through your stomach activates your central nervous system to numb the sensitivity in your nerves producing an effect that helps your relax. 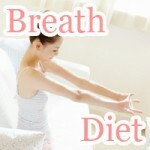 This is especially important when dealing with nervousness and stress by taking deep breathes through your abdomen. Don't worry this isn't going to take the fun out of karaoke as you will still be able to enjoy yourself singing carefree as you usually do and burn calories per song. Here are three ways enhance you karaoke diet turning each song into a set adding up to your eventual weight loss. You know how it is. It all starts out with getting something down your throat so warm up your vocalizers and the next thing you know there had better be someone supervising the party. Drinking more than you sing at karaoke is a good way to get fat fast. Don't drink more than you sing and you are home safe. How much can I drink at karaoke and still burn calories!? To help you decide how much to drink while out singing, you have to know the calorie equivalent to singing one song. It turns out that you burn between 10 and 20 calories singing one karaoke song depending on how rowdy you get. Here's a simple table to help you do the math when you shouldn't have to at karaoke. ** Base on a 10Cal per song calorie equivalent. When singing hard rock songs which like to stretch the vocal notes, it is almost impossible to get it right without digging deep into abdominal breathing. Loosen up your limbs moving your body while you stand in front of the mic to get a better aerobic workout while you are having the time of your life. The benefits of abdominal breathing are endless. Just by shifting your breathing techniques can you slim down your waist and keep the shape of your pelvic region intact. Breathe from your belly to lose stomach fat. Turn the action of exercising your abs into an unconscious measure with diaphragmatic breathing with aerobic exercise. Ready to get the best ab-workout and burn off calories you had in your life? Actually, this isn’t the first time. Remember that time you busted out laughing and couldn’t get up. Well, there it is the laugh-diet. The best part about karaoke is that anyone can sing. That means anyone can lose weight singing. How sweet is that? 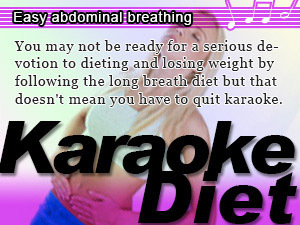 You may not be ready for a serious devotion to dieting and losing weight by following the long breath diet but that doesn't mean you have to quit karaoke. When it's your turn to sing at karaoke, you should be singing "That's 10 calories I don't have to worry about later" Don't hold back.